We have show day in Cologne, so we got up, checked out of the apartment, and hit the road again. We got stuck in rush traffic for a couple of hours on the way in to Cologne, so we were getting pretty late. The show in Cologne was being filmed and broadcasted on the big concert show, Rockpalast, on German TV. Also, we were doing an interview for the TV show before soundcheck, so time was running tight! We finally tore loose from the traffic jam, and made it to the venue an hour late. We were met by the TV team, who had been standing by for quite a while. We got the interview done straight away, before we rigged our gear and got the soundcheck done. Approaching showtime, the crowd was getting bigger, and we took the stage to a noisy welcome from the Cologne crowd, who seemed more than ready to help us make this a great concert and TV experience. The show went really well, with a full TV production and great response from the crowd, singing and yelling along to the songs. I’m being told the concert (Sahg and Clutch) will be broadcasted some time early July, so that’s a chance for those who weren’t there to catch the show. I had a beer with Clutch singer Neil Fallon after the show, and he told me he wasn’t too comfortable in front of the TV cameras, but he thought the show went well nevertheless. He was very right, of course. Speaking of Mr. Fallon and the rest of the Clutch camp, I can’t mention enough times what a great bunch of guys they are. There are enough headliners and cocky crew members in the business who try their best to act like assholes towards the support acts, but with Clutch it’s the complete opposite. They have treated us like friends and equals since day 1, always with a friendly handshake and a smile, chatting along about music and what not, and giving compliments on our efforts. When the headliner seems sincerely grateful to have you along, it is no stress being a support act! So big cheers and thanks go out to Clutch for having us along! Day off in Cologne, time to check out this nice city, and not least the amazing Kölner Dom. The monstrous gothic cathedral is the inevitable centerpiece of Cologne, with its two black towers rising sky-high into the air. Standing in front of it, the colossal scale, the architectural detail and its general grim expression is just mind-blowing. On the outside, it looks like something built to worship Satan, rather than God! On the inside, however, it gives more the impression of a „regular“ cathedral, but the scale of things, the incredibly detailed ornamentation and the enormous stained glass art on the windows is still completely overwhelming. Regardless of religious belief, you can’t help being blown away by this breathtaking work of art! Final show day with Clutch, and we are headed for Stuttgart. The drive goes through the Rhine Valley, with hills covered in wine fields as far as the eye can see. We reach Stuttgart and the venue LKA Longhorn early, and get to chill out for a while before loading in. LKA Longhorn is the largest venue on the tour, with space for 1,500 people. After Clutch’s soundcheck, we gather both bands on stage for a photo together and a final meet & greet before we part ways. As mentioned, we have had nothing but positive experiences with the Clutch guys, so there were all good and happy vibes. We went on with our soundcheck, and passed the time at the venue before showtime. When we took the stage at 8 p.m., the room was already filling up nicely with a big crowd ready to watch our set. From the first note of Slip Off The Edge Of The Universe we could tell this show was going to be special, and the crowd livened up rapidly during the next couple of songs. LKA Longhorn has a very cool stage that gives you great contact with the audience, and there was some strong and genuine band vs. audience communication going on. Half way through, we had them in our clutches, and by the end of the set, the response was amazing, with the audience returning a lot of noise with their arms up in the air. It seems we won them over again! So our final show with Clutch definitely ended on a high note. We had to hit the road to Frankfurt shortly after our show, and checked in at a hotel right by the airport after driving for a couple of hours. We spent the night there, since the return flight to Norway was the next morning. So, the next morning it was time to turn our heads homeward, all in a happy mood, but at the same time with a feeling that we sure wouldn’t mind staying on the road with Clutch a while longer. It had been such a blast! But not to worry, there are new highlights on the horizon for Sahg coming up already over the next few days. Firstly, Tons Of Rock, the new grand metal fest in Norway, only three days after the last show with Clutch. Secondly, the opening slot for Iron Maiden in Bergen, Norway, on the 28th of June! And not least, we return to Germany to play the closing show at Summer Breeze Festival, on the 16th of August!! 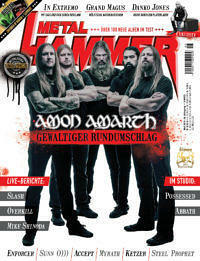 So, we are out of here for now – thank you Clutch, thank you Metal Hammer, and thank YOU – the metalheads of Germany! Die Kollegen von ROLLING STONE haben sich die Mühe gemacht und 200 Politiker nach ihren Lieblingsalben gefragt. Wir haben es uns einfach gemacht und präsentieren euch in der Galerie eine Auswahl von Politikern und ihren Lieblings-Metal-Alben!